I recently read an email where a colleague described the repeat climbing of the Blue Hill service ramp as a “bore-fest”. I chuckled when reading it; I suppose that can be true depending on how you look at it. When I first started climbing the service ramp, I thought that way about it too. But I have since changed the way I think about it and experience it. Now it’s kind of zen like; I, the bike and the hill become one. Here’s what I’ve learned and now experience each and every time I make my trek up and down the hill. If you ride hard and fast to defeat the hill; the hill will always defeat you. Set your pace and do not veer from it; sit up strait, loosen your arms and your grip on your handle bars. Feel the strength, heat, burn, motion and power within the muscles of your thighs, knees, calves, ankles, feet and toes as you push and pull through your peddles in each degree of every 360 degree rotation. Breath deeply, slowly and mindfully; sense your heart beating, the oxygen and flow of energy pulsating throughout your body with every inhalation. Fully take in and experience your surroundings; the coarseness, smoothness, bumpiness, irregularities and constant changes of the ground beneath your tires; the gentle breeze flowing down the hill weaving in and through the trees; the homily of the trees as they bend and twist from the breeze and sing ever so softly from the fluttering of their leaves; the cool, crispness and subtle changes in temperature as the breeze reaches you caressing each blade of hair on your legs and arms dissipating the sweat seeping from the band of your helmet rolling down your temple to your cheek. Yes! Take it all in! All of It! Let your thoughts be not about reaching the top of the hill but only about the current moment, the space that you are currently inhabiting in the now moment you are in; there you will find peace and pure bliss. When you get to the top of the hill, take a moment; take a few deep breaths and down a few gulps of water; then take a bite out of your energy bar. Now take a moment to appreciate what you have just done; take a few more deep breaths and then begin your decent. Heighten your senses as you again take in every now moment. Even though you are rapidly descending down the hill at a much faster pace than your climb, if you concentrate only on the present moment, time will slow down and you will again experience peace and pure bliss. When you reach the bottom, again, pause for a moment, take a few deep breaths and appreciate what you have done; then begin the climb again. You may eventually find that the math of climbing the hill is simple; Peace + Bliss = Joy. 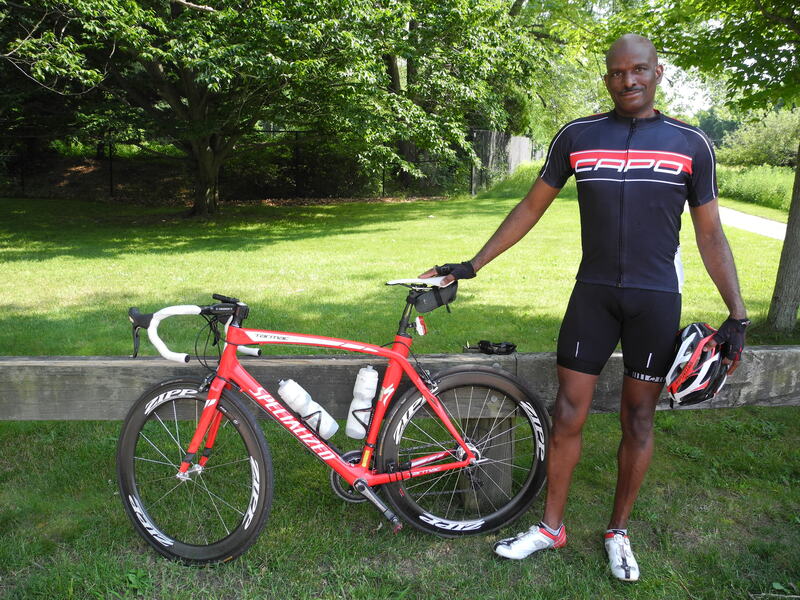 My younger brother (and cyclist) sent me to your post … great advice for cycling and for life!